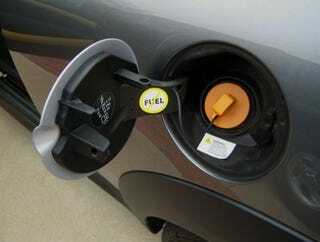 REMINDER: Do Not Put Gasoline In Your Electric Car! MINI's added a special sticker to the charger ports on their MINI E reminding drivers not to put fuel in it. Perfect time for a JaloPSA to remind everyone that electric cars and gasoline do not mix. We would like to point out that back when we drove it here in New York, we didn't need a silly "No Fuel" sign. That is all.